Eggs Benedict is a favorite breakfast of mine. But what I have found after ordering it out at breakfast numerous times, is that nothing can rival my mom’s. It was something she only made for my brother and me during Christmas and birthdays. I remember that we always had breakfast after Christmas presents were unwrapped. While I was always thrilled with my gifts, the passing of all unwrapped surprises threatened to be anti-climactic. But there was always eggs Benedict to look forward to! It remains among my favorite Christmas memories. My mom, being extremely organized, had the cooking process down to a science. She would cook the Canadian bacon and toast the English muffins first, and then wrap each in foil packages to put into a warm oven. Her poached eggs were perfection. The hollandaise, sublime. When I got to a certain age, she would call me sous chef and let me stir the sauce until thick and delicious. One thing that’s special about my mom’s hollandaise is how much lemon juice there is compared to other recipes. It has a wonderful acidity that brings out the flavor of the other components. This time, when making eggs Benedict, Wilson and I decided to use smoked salmon instead of Canadian bacon. I’ve seen this idea numerous places and it proved to be summery and delicious. Wilson – sous chef par excellence – made the hollandaise while I poached the eggs. His sauce tasted exactly like my mom’s, and was amazing. This recipe, while seemingly complicated, is all about assembly. Sometimes a little weekend indulgence is just what the doctor ordered. First, begin making the hollandaise. Put the egg yolk, 2 T butter, and the lemon juice into a small saucepan. Put the saucepan onto a burner with very low heat. Begin stirring immediately and continue stirring until the butter is melted. This will take a few minutes. You can begin toasting the English muffin at this point. While the butter is melting, begin boiling water for the poached eggs. I also like to add some white vinegar or lemon juice to the water. (It keeps the egg together.) After the water becomes hot, turn the burner down to low heat. Once the first hollandaise butter has melted, add the remaining 2 T butter and continue to stir constantly over low heat. The sauce will thicken as it cooks, and should be stirred until all the other components are ready. If the butter starts to curdle, you can add a touch of milk to the sauce. To poach the eggs, crack an egg into a small dish and pour it gently into the water. Your water shouldn’t be bubbling, but you’ll see steam rising off the top. As you pour the egg into the water, use a small spoon to gently push the egg white together and toward the yolk. Repeat with remaining egg. Assemble an open toasted English muffin half onto two plates. Top with the smoked salmon. The eggs will each take about 3 minutes total to cook. There should be a white film over the yolk, and if you push the egg slightly with a spoon, the yolk will jiggle a little. When the first egg is finished, turn off the stove and remove it with a slotted spoon and hold the spoon over paper towels and blot the egg white slightly so it’s not too wet. Repeat with the remaining egg. 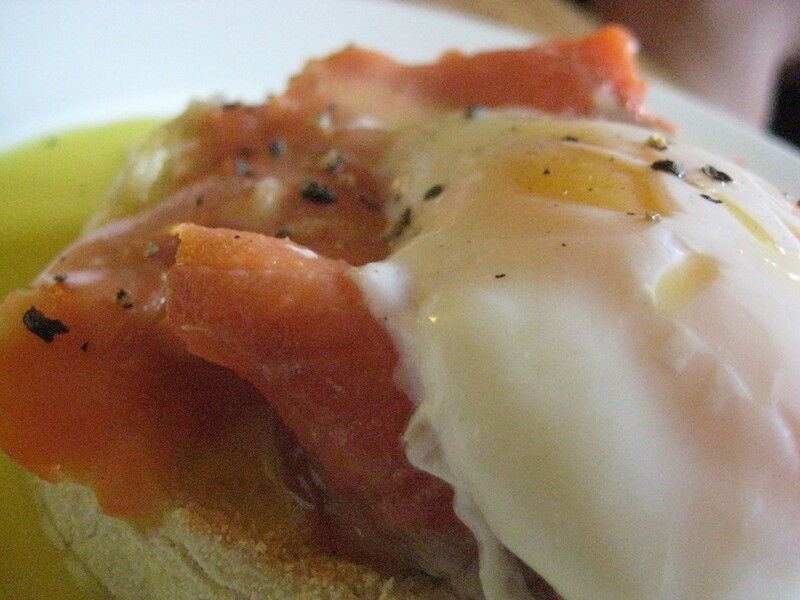 Place the blotted eggs onto the smoked salmon. At this point, your hollandaise should be thick and lemony. Taste it to make sure all is well. 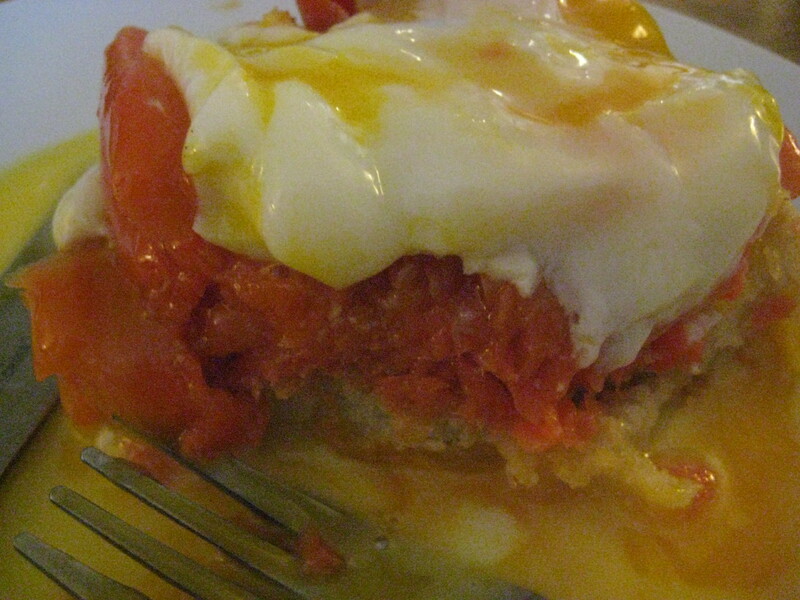 Spoon generously over the poached egg tower, and enjoy! Note: This recipe is for two people, but can easily be multiplied. You may also want larger portions depending on appetite. When I was younger, I could easily eat two eggs Benedict towers.